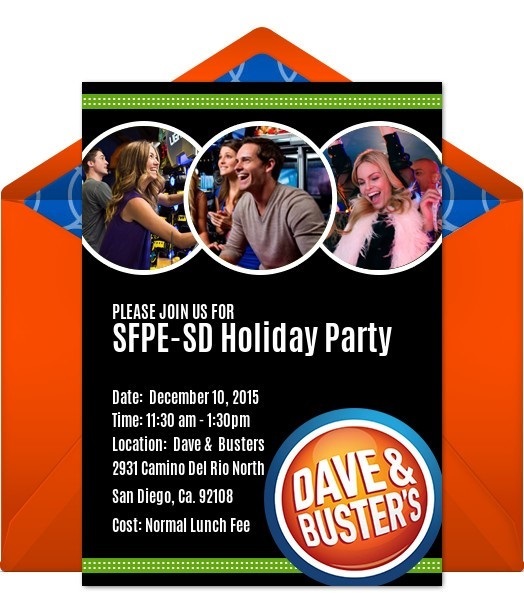 Welcome to our first Annual SFPE-SD Holiday Party at Dave & Busters in San Diego. Please join us for this fun social event where you will each get a $15.00 dollar game voucher towards the arcade games along with a buffet style meal and soft drinks. The Burn Institute will be attending for a brief overview of their most recent and upcoming events. To Vendors – We welcome any gift prizes donations towards a raffle at our Holiday lunch meeting for our attendees. Please RSVP by Monday December 7th and please pay on line on our website. We look forward to seeing you at our Holiday Party.